The benefits of food go beyond the physical well-being into a deep emotional well-being. Certain foods have been found to reduce stress and anxiety in human beings. Eating has been shown to bring a sense of calm onto a person. 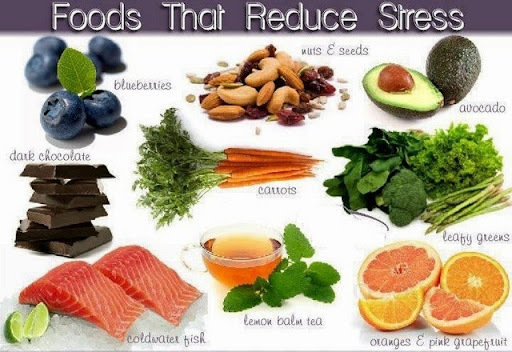 Here are some top foods which help in relieving stress. "Stress is a part of daily life and many people turn to food to relieve themselves from feeling overwhelmed, anxious, or depressed. The problem, however, is that most of us reach for something sugary or fatty," explains VeraVia director of nutrition Lisa Mittry. "While those foods sometimes provide temporary relief, in the long run they can wreak havoc on your overall health or ultimately counteract your efforts to reduce stress." Here are VeraVia's suggestions for dietary choices that can lower stress levels. Almonds contain the stress-reducing vitamin B12 and the helpful anti-oxidant vitamin E that can balance out emotions as well as counteract the physical manifestation of stress known as cellular oxidative stress. Mittry recommends a half cup of unsalted almonds as an afternoon snack or starting off the day with almond butter on whole wheat toast or a cup of almond milk in cereal. Depression can be caused by low levels of folic acid and a healthy dose of asparagus can replenish one's folic acid balance. Mittry suggests sauteing asparagus as a side dish for dinner, mixing it with rice for lunch, or mixing it into a scramble or breakfast omelet. Bananas are high in potassium which can help lower blood pressure. "A single banana on its own is a healthy and smart snack on the go," says Mittry. "Or, incorporate bananas into everything from cereal, oatmeal, smoothies, or a fruit salad." Mittry understands that sometimes stress needs a physical release. "Don't underestimate the power of diffusing some natural angst while crunching down on something satisfyingly hard, like carrots," she explains. Salmon, tuna, and sardines are high in omega-3 fats, which are good for the heart and help equalize stress levels. Paired with asparagus and a side of carrots, fish is an excellent meal choice for regulating stress. Vitamin C lowers cortisol levels, the hormone that causes stress. It can also lower blood pressure. A glass of orange juice every few days can be helpful but Mittry urges dieters to resist the urge to turn to orange juice every time one feels stressed, because orange juice contains lots of sugar. "The healing benefits of tea are long known but many people don't think of using these ancient herbs to reduce their modern-day stress levels," says Mittry. She recommends Passionflower, Siberian Ginseng, and Hawthorne teas, which have all been shown to reduce stress levels. Turkey contains tryptophan, which is a naturally calming amino acid. Mittry suggests opting for a turkey sandwich at lunch or a preparing lean turkey soup (instead of chicken) in the slow cooker for a more relaxing meal. Mittry concludes by saying, "Don't accidentally sabotage your efforts in mindfulness with foods that undermine stress reduction. By shifting your diet in the direction of the foods above, you can use your body to calm your mind."